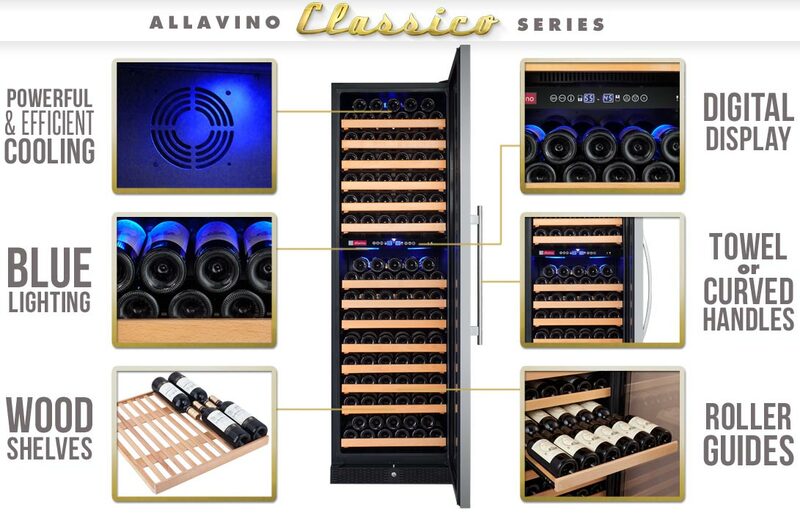 Superior storage for both red and white wine is more convenient than ever thanks to Allavino's Classico Series YHWR172-2SWRN/YHWR172-2SWLN Dual Zone Wine Refrigerator! Within the elegant finished black cabinet with brushed stainless steel framed glass door a temperature divider and directional fans channel cool air where it's needed most, creating two distinct cooling zones that can each be individually controlled using a digital temperature display with user-friendly push-button controls. Your bottles are stored on sturdy wooden wine racks that glide out on full-extension rollers for easy access to every bottle, and cool blue LED display lighting makes it even easier to find just the wine you're looking for. This dual zone wine refrigerator allows you to store both red and white wine at different temperatures, allowing them to be aged according to their individual needs. The upper zone can be set between 40-56° F to store white wines, while the lower zone can be set between 54-65° F to store red wines. Internal fans direct cool air where you need it, and the state-of-the-art compressor has been intelligently designed to provide powerful cooling while remaining energy efficient enough to meet strict California Department of Energy consumption guidelines. Your wine is reliably stored on fourteen durable wooden shelves, which gently cradle your bottles to reduce harmful vibration that might disturb your wine's sediment during long-term storage. Each shelf (excluding the bottom shelf) extends out on telescoping roller assemblies to allow you to easily view and access every bottle in your collection - even the normally hard-to-reach rear bottles! An intuitive digital temperature display with user-friendly push-button controls lets you easily manage each zone individually, and provides precise control by allowing you to adjust the temperature up or down in one degree increments. Once the desired temperature has been set, the display will show the current temperature in the cabinet, making it easier than ever to keep track of the unit's performance. The powerful control panel also allows you to control the cool blue LED lighting, toggle the display between Celsius and Fahrenheit, and turn the unit off with the push of a button. This wine cellar combines high performance storage features with a classic elegant design that is sure to impress your guests. It has a front-venting construction that allows it to be built-in to cabinetry for a seamless look, and the sleek black cabinet has a fully finished top and sides that will make it a stunning addition to any room of your home. Elegant wooden wine racks, cool blue display lighting, and a UV-protected glass door complete this breathtaking showcase.